Want to know the one thing you can do (other than seeking God) to make the absolute most out of your new season? Want to know the one thing that can set the tone for your whole season and align you with what God wants to do for you and in you? THIS thing is the special one thing I do when every new season begins. And this thing absolutely has shaped every new season of my life for years. THIS thing is how I’m so productive. THIS is why I can be a wife, a writer, a professional in a Fortune 500 company, a teacher and prayer leader at my local church, and serve in many other areas in ministry–along with taking time for myself and my husband to rest and go on vacations. And this is how you can become as productive as YOU desire to be. This is how I know exactly what I’m called to do. It’s THE reason I only do what I’m called to do, and I say no to everything else. And this is how you can receive direct revelation from God about exactly what YOU are called to do, too. THIS is how you can order your life so that you’re walking in the fullness of God’s best for you EVERY MOMENT. When a new season starts, go on a vision retreat. Maybe you’re a busy mom, and the only way you can get away is to lock yourself in the bathroom and sit in a dry tub. Maybe you can get away to a local park. Spread a blanket on the grass and get on your face before the Lord. I have retreated to my spare bedroom. I have retreated to a cabin in the woods at a local state park. I have retreated to fancy hotels with amazing views of bustling cities. Whatever. Do what you can, where you can. But take a vision retreat. If you want to know more about how to do a personal vision retreat, I explained the whole process here in How To Get Heavenly Design For Your New Season (My #1 Technique). Please read it. For your vision retreat, you’ll want some guidance. So earlier this year, I made the material that I wrote for my own personal mentees–my own spiritual sons and daughters–publicly available. 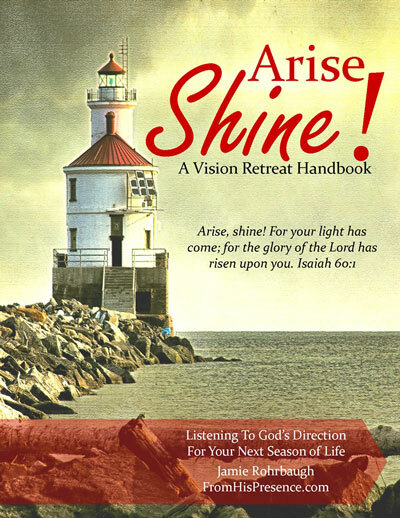 My vision retreat workbook is called “Arise, Shine.” You can read more about it below. You can’t duplicate this material anywhere else. It’s directly from my heart, inspired by the Holy Spirit, to the hearts of my sons and daughters. I wrote this for the people into whom I pour out my life day after day after day. And TODAY, TOMORROW, AND SUNDAY–September 18, 19, and 20–until 8 PM Sunday night, I’m making Arise, Shine! available to you at a deep discount. The normal price is $15 for the workbook PLUS a huge amount of bonus material. Today through Sunday at 8 PM, you can get $5 off by using the coupon code “five” (no quotation marks) at checkout. Go on a vision retreat. Get Arise, Shine! to help you. My personal weekly goal forms that I use (3 different versions for different walks of life). All of these materials are downloadable, printable forms. (They are not available in hard copy format.) They are also formatted in the lighthouse design you see on the book cover above, to remind you of the Holy Spirit shining His light into your future. This material will help you stay on track with the vision God gives you and keep shining all year long! So don’t wait! Hurry and take advantage of this special offer to get Arise, Shine! at this special, discounted rate! Hello Jamie, thank you for your posts. I read it on my nokia phone. I keep trying to download your material, such as arise shine but it goes to another page. Twice. I hope you can tell me how I can get it. Please pray for me my husband and 5 boys. 4 adult and a 7 year old ! We are blessed. Praise Father God, thanks be to Jesus Christ ? Finances, one son at university, one on a fitness course to be a personal and gym instructor, one a plumber but unable to get a work placement in order to do gas safety portfolio. Me, finances, abdominal bloating which I think has been set against me. Nothing medical found but extreme bloating like am pregnant. And yes, absolutely, I will pray for you this very day! I’m sorry you guys are going through a hard time. Hang in there, sister! 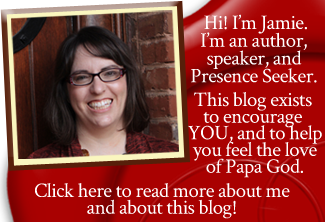 I have really enjoyed your blog. Keep up what Father God is doing in you. I have been truly BLESSED.